I haven't been blogging a lot. It wasn't a conscious decision; it's mostly just that I don't feel like I have much to say, or I don't have spare time, or I don't feel like blogging because I'm not alone, or... well, I don't actually know. Jason moved in a couple weeks ago, and I've not found myself without someone to talk to in that time. It's certainly true that over the past year since we met I've posted here quite a bit less. I never really thought of blogging as something that I did when I felt like talking and didn't have someone to talk to, but perhaps that is actually the case after all. I actually think that the reason is a combination of various things. I don't like repeating myself (though I certainly do it from time to time), and when I use up all of my interesting stories in person, I don't usually feel like blogging them. Or maybe I just haven't felt like writing very much. Who knows. Having a roommate has been good so far, though. We certainly have overlapping interests, so at the very least I don't have someone around who would be annoyed if I played games into the wee hours of the night. There's a pretty significant difference in our levels of organization and cleanliness—I'm quite a bit of a neat freak and, well, there are piles of papers and clothes and cords on the other side of this room now. We'll see how that goes. He also has to get up ridiculously early three days a week for an early class, as in three hours earlier than I want to, but for the most part I can sleep through him getting ready and closing doors and such. So far, we seem to be managing just fine. 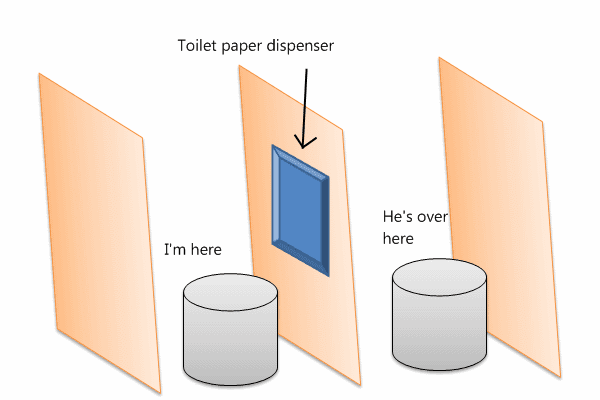 Today while on the toilet at the gym, I learned that when the attendant opens up the toilet paper dispenser in the stall next to you, you can see right through the wall. And so can he. He can watch you poop. I would like to have a stern talking-to with the person who designed that toilet paper dispenser. It is a documented fact that I enjoy singing along to music on my way to and from work. When I'm singing along, I usually try to mimic the way that the original artist is singing it, copying each soulful inflection, semierotic grunt, and tremor. When the artist screams, I scream too—though that sort of mocking whisper-scream where you pretend to be screaming but really aren't making much noise at all. I do this without even really thinking about it most of the time. I know that I don't really even think about it that much because it wasn't until halfway through Kanye West's Love Lockdown today that I realized that I even mimic the distortions in his voice produced by a vocoder. I found myself unaware that I was, in fact, singing in a robot voice. I got my tickets for my Christmas trip to Nebraska last night, and I saved a couple hundred bucks over what I usually pay. Bing Travel has a couple neat features that worked out pretty well for me: you can get an RSS feed of a particular itinerary and easily track when prices change, and it will predict whether prices are likely to go up or go down from where they are. I hadn't realized how much the prices of flights fluctuate until a couple weeks ago. A flight that I usually end up paying $600-700 for dipped down to the $500s a couple weeks ago, and for a moment last night dropped down to about $365. By the time I was able to complete a purchase the price was up to the low $400s, but still, that's a pretty significant savings over what I usually pay. In fact, it's roughly the price I was going to have to pay on top of using 35,000 reward points on my credit card, which are themselves worth about $300. Now that I know how much prices can fluctuate, in the future I'll have to remember to be more patient and vigilant when buying flights. Jason and I stopped into Office Depot to pick up a few school supplies. While we found some of the items we were looking for, try as best we could, we could not locate either notebook paper or regular Bic ball-point pens. (We did, at least, find other brands of pens, and Bic pencils.) If that's not an "F" in back-to-school store organization I don't know what is.